The Polaris Series is part of our custom line of cabinet stands available exclusively by special order. Shown in Semi Gloss Black, this style is modern and sleek. It features chamfered edges on all sides for a uniform and clean look. To round out this design, it boasts flush mount doors with recessed matching door pulls. *Finished in a stealthy Semi Gloss Black. 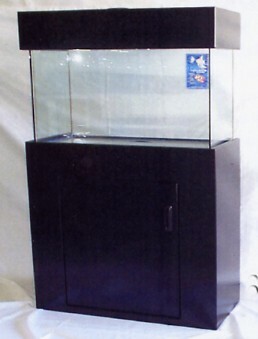 *Solid top deck that is recessed to conceal the aquariums bottom frame. *Flush mount, touch latch doors with black pulls. *Removable rear brace for wasy installation of filtration and mechanical systems. *Matching 6.5 inch canopy available (as pictured).